Living with the limitations of fibromyalgia is not an easy thing to do. It’s one of the hardest lessons I’ve ever learned in my life. Updated on May 12th 2018 – Today is Fibromyalgia Awareness Day and Myalgic encephalomyelitis Awareness Day. 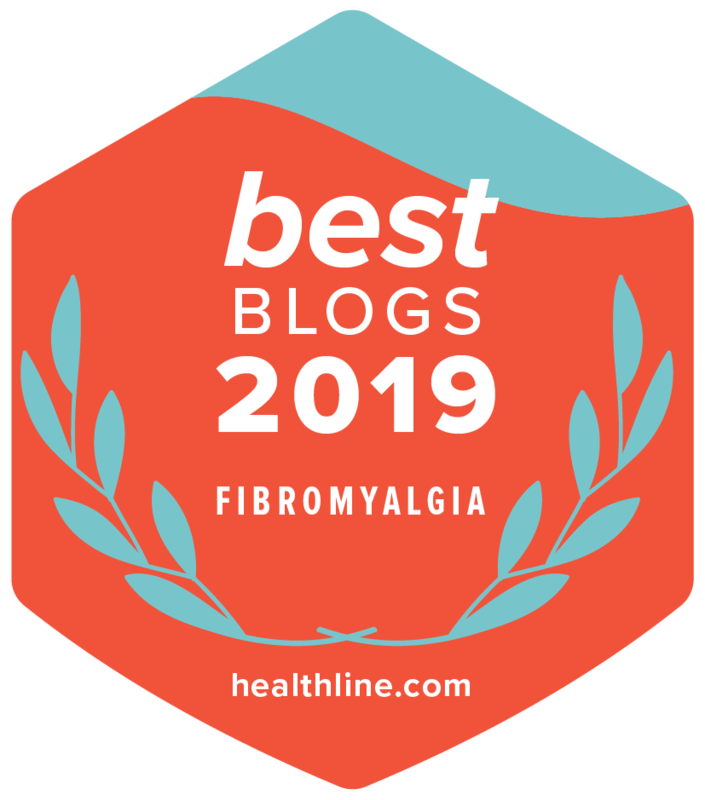 I’m still living within the severe limitations of Fibromyalgia, but today got infinitely better when I learned that My Several Worlds has earned one of the tops spots with Healthline’s Best Blogs about Fibromyalgia in 2018! Nothing has changed much since I wrote this article in July 2016. I have left my job and I’m pretty housebound now. I leave my house maybe once or twice a week at the most, and never for more than 4-6 hours (depending on where I am sitting). There is always a payback to leaving my house and doing any walking. One of the biggest challenges with chronic illness is learning how to live with limitations. Fibromyalgia creates pain, autoimmune fatigue, and poor sleep patterns that don’t allow patients to cope with day-to-day activities at times. I am always open about discussing my limitations with anyone who asks. Writing about the limitations of Fibromyalgia (plus AS and ME also known as Myalgic encephalomyelitis) lets others know what we live with on a daily basis. These limitations can range from small disruptions to severe disruptions that leave people housebound. Learning my limits has been a hard lesson to learn, but I know my limitations pretty well after all these years. Sometimes I knowingly surpass my limits if I really want to do something; I also have hard lines that I never cross. Today, I’m writing about a few of my limitations with chronic illness, such as Fibromyalgia and Myalgic encephalomyelitis, while recovering from a two-and-a-half-hour walk around my high school this morning with my dad. I’m hurting pretty bad right now. I overdid it today. Muscle fatigue is brutal. Think of how weak your legs feel after you’ve gone for a run. I have this all the time and it gets worse throughout the day. I struggle constantly with extreme muscle fatigue. I can’t lift or carry things without severe consequences. Exercise makes me worse. Walking for more than an hour leaves me feeling utterly drained and the agony hits if I’ve been standing for more than 10 minutes. I walk a fine line between doing any exercise and overdoing it. It is SO easy to overdo things. I have gained some strength back over the past few months, but I still have to keep a close eye on energy reserves. If I’m out, you might notice that I keep my arms close to my body. Having to wave or raise my arms to do something always hurts. I conserve more energy and feel less pain when I have my arms near my body. Last week, we came back from our family cottage in North Bay. When we got back to my parents’ house, I helped unload the truck like any good kid would do. I unloaded all the pillows, blankets, and small bags of things, and I carried in four heavy items that roughly weighed about the same as a 12-pack. It was hard for me to watch my parents do most of the work. I know they gladly do it to spare me pain. I wanted to help, so I did – despite knowing the impact my actions would have on me the next day. It felt good to contribute and feel useful. The downside to this was that the next day I couldn’t lift my arms – not even enough to pick up a glass of water without supporting one arm with my other arm. Doesn’t that sound crazy? This is a classic example of Myalgic encephalomyelitis and mitochondrial failure. This is why I pick and choose what I carry and how much activity I engage in. It is a form of self-preservation. A few months ago, I was driving to a meeting with my husband. When I got in the car, I noticed the strong odor of gasoline and my head started pounding within minutes. We rolled down all the windows; it didn’t help. Within 10 minutes, I was dizzy and nauseous. My throat started closing up and my lips went numb and started swelling. I couldn’t think straight. After 20 minutes, I asked my husband to pull over. As soon as I got away from the smell of gas, my throat stopped swelling. My lips and tongue stayed numb and swollen for the rest of the night and the headache turned into a migraine that lasted three days. The next time I got in the car, the same thing happened. The fumes made me feel weak, confused, and dizzy. I dreaded getting in our car after that. We got rid of it within two months. People with fibromyalgia are sensitive to smells, lights, touch, foods, sounds, and more. Learning about an offending smell or environment allows us to protect ourselves from it. My limitations with fibromyalgia have taught me to increase my awareness of what bothers me or makes me sick. That extra level of awareness is becoming basic instinct for me. That is why I plan in advance and choose whether or not to participate. My level of participation is determined by how much I want to do it, despite the consequences. Category 1: Nope. I’m Not Doing It. In August 2017, I was too sick to go to my sister’s wedding because of my health. I never thought that would happen, and I’m not sure if weddings need to be moved to Category 1 now. If I missed my own sister’s wedding, how would I attend anyone else’s without getting extremely sick afterwards? This includes everything from activities, events, and relationships that I find tolerable when I am feeling well, but that sap my energy when I’m not feeling well. I make my decision based on how I feel that day.